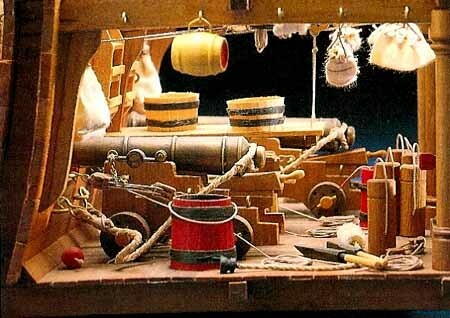 Great wooden model ship kit for the beginner or intermediate modeller. 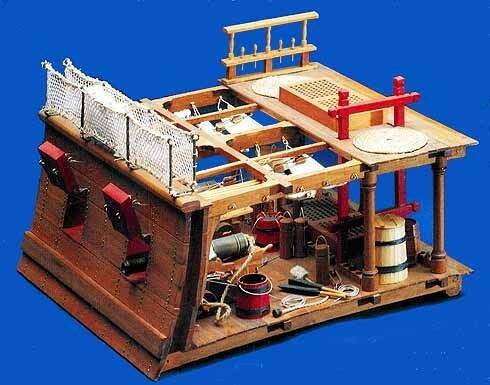 Build the second gun deck of an British ship of the line with intrictae detail. This kit features two 4" long machine turned brass cannon on walnut carriages. It comes with Fuse buckets, shot cartridges, plugs, mess tins, tables and benches, gun powder and water barrels. Most parts are made of walnut, pine, maple and beech, and all are laser cut. Fittings are cast metal and turned brass. Rigging line plus cloth and netting for the hammocks and nets are also included. Two sheets of plans and instruction book make this easy-to-build kit a delightful addition to any collection.